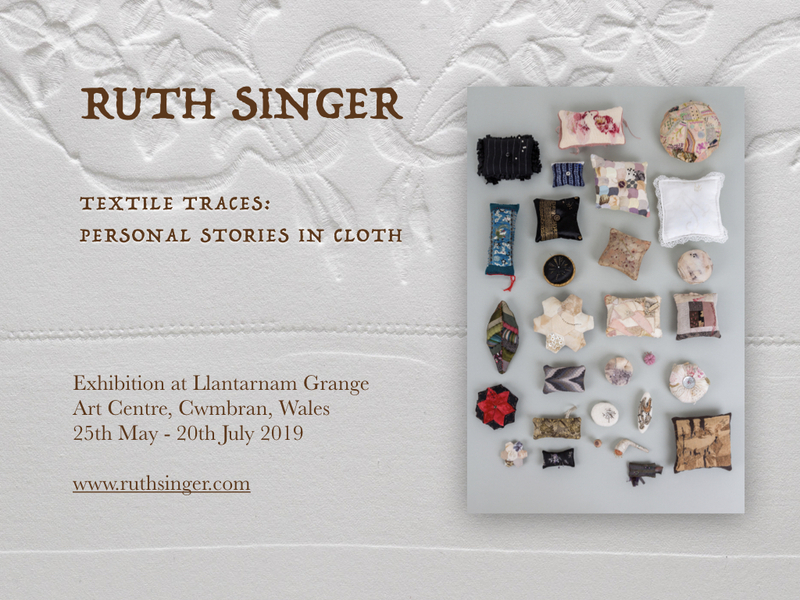 My new solo exhibition, Textile Traces, opens on 25th May at Llantarnam Grange Art Centre, Cwmbran, Wales. The opening event includes an ‘In Conversation’ event with me and Polly Leonard, founder and editor of Selvedge magazine. This event is free and takes place 12-2pm on Saturday 25th May. The exhibition continues until 20th July 2019. I am also running workshop at the gallery on Saturday 22nd June to create tiny pincushions inspired by those in the exhibition. Booking details here. A similar workshop will run in London hosted by Selvedge on Saturday 27th July. I’m pleased to have had another piece accepted into the Fine Art Quilt Masters at Festival of Quilts again this year. 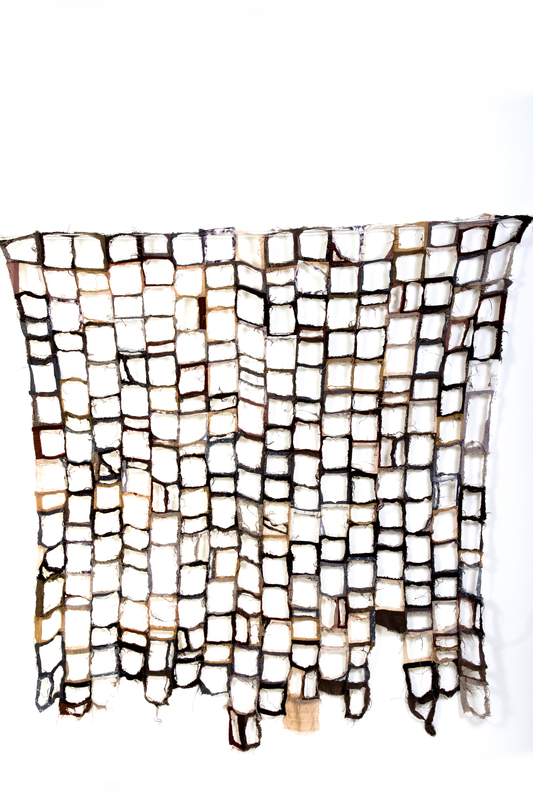 Tracery will be shown in a large gallery with a lot of other really exciting textile pieces, 9-12th August. I will also be exhibiting my Criminal Quilts project in a gallery of its own too. This piece was originally made for my 2017 solo exhibition Fragments, with the Quilt Association. Tracery is a direct response to the quilts in the Quilt Association collection. When I went to view the quilts I was entranced by the damaged ones and chose to make work which reflected this. Tracery has been made and unmade to create a quilt purely of seams holding the remaining threads together, just like the quilting stitches holding together quilts which would otherwise fall to pieces. To quilt lovers, my preference for the discoloured reverse, the wrecked by laundering, the paint-spattered and the pieced army blankets may be puzzling but I love the stories held in damaged or ordinary cloth. The humbler the better for me. I am interested in what it says about those who made it, bought it, sold it, used it, abused it, preserved it and mended it. My training in museum work taught me to look at objects from every angle, exploring every possible story to understand the thing as a whole, not purely as a visual object. As an artist I choose to look from one very specific angle and to explore that rich seam of narrative in as much detail as I can. In case you missed it, I won the Fine Art Quilt Masters competition in 2016 which helped me fund and develop the Criminal Quilts project which I will be showing at this year’s festival. My Criminal Quilts series originally commissioned by Shire Hall Gallery is probably my best known work including the 2016 Fine Art Quilt Masters winner. This winning piece will be exhibited in the Minerva Arts Centre this summer and the patchwork piece will be at Unit Twelve from the end of April. I’m really excited to be starting a new project taking this work further with Staffordshire Records Office in 2017-18. I’ve just received funding from Arts Council England to develop new work, exhibitions and community partnership projects based around the original archive material relating to Victorian women criminals. To celebrate (or actually, co-incidentally) I’ve got a free workshop on Sunday 26th March at New Walk Museum in Leicester inspired by this series of work. Inspired by Ruth’s work and using silhouettes of hands, create your own piece with a personal touch. Explore drawing and creating patterns on paper with your own hand outline and embellish with embroidery, fabric and paper collage. No previous experience is required. The workshop is FREE but booking is essential. Call the museum on 0116 225 4900 to book your place. Small fragments of cloth combined to make a greater whole. Each stitch, each thread, each moment of the maker contribute to a broad canvas of narrative. I have been invited by the Quilt Association to showcase some work in their summer show and chose to spend time developing new work inspired by their collections. Fragments is a series of work in textile and mixed media developed from my research with these quilts, from years of considering antique textiles and the stories they hold and from my desire to express my thoughts about museum collections through making. For me, the joy of this collection is that it is mainly rescued quilts – saved from charity shops, from life as dust sheets and from languishing forgotten and unloved in garages. This collection does not aim to be a representative array of fine Welsh quilts it merely (and importantly) aims to save old quilts so others may study and enjoy their making. While the quilts vary enormously in age, provenance, quality and condition, they share a defining characteristic of narrative. Many of the locally-made quilts come with priceless stories about their making or their family history (accurate or otherwise) and those which do not have equally exquisite (to me at least) stories of tragic retirements in sheds and subsequent rescue. The stories which these quilts embody interest me as much as the cut of the cloth and the finesse of the stitching. The quilts speak of poverty and extravagance, of luxury and desperation, of comfort and of tragedy. They tell stories not just of their making but of their long lives. Some have been repurposed to catch paint or oil spills when handmade quilts had no charm or value. Some were made from the humblest of materials to keep loved ones warm and were never intended to be preserved, admired or studied. Others have had harder lives in the more recent past – badly repaired and hacked about or nearly ruined by machine washing with the best of intentions but with the most damaging effects. To quilt enthusiasts, my preference for the discoloured reverse, the wrecked by laundering, the oil and paint-spattered and the pieced army blankets may be puzzling. But I am not a quilter, not a quilt scholar (except I admit of trapunto quilting) and I do not look at these pieces of old cloth as a someone who wishes to chart the piecing pattern or pass judgement on the number of stitches per inch. The humbler the better for me. The feel of the quilt is most important to me. What it says about those who made it, bought it, sold it, used it, abused it, preserved it and mended it interests me far more. My training in museum work taught me to look at objects from every angle, exploring every possible story to understand the thing as a whole, not as a purely visual object. As an artist I choose to look from one very specific angle and to explore that rich seam of narrative in as much detail as I can. I am interested in sharing, through my making, how these quilts make me feel. I will be sharing the development of this work over the next six months on the blog and social media. You can also keep in touch via my email newsletter once a fortnight. Alongside this new work I will also be showing my Fine Art Quilt Masters winning piece and other pieces from the Criminal Quilts series. The exhibition takes place at Minerva Arts Centre, Llanidloes, Mid Wales 5 August 2017 – 16 September 2017. I am also running a three-day Summer School on Experimental Quilting 31 August 2017 – 2 September 2017 (full details to come shortly). This piece will be exhibited in Unit Twelve’s new exhibition (Surface) Pattern 27th April- 26th August 2017. I’m also running a natural dye workshop at the gallery on Saturday 29th July where you can create lovely patterns on cloth using foraged plant materials. Workshops and talks at Festival of Quilts 9 – 12 Aug 2018 will be announced soon. Little Selves is an exhibition celebrating the portrait miniature showcasing exquisite pieces from the collections at New Walk Museum Leicester alongside new work by Leicester Society of Artists members and a schools competition. The exhibition takes place 25 March – 25 June 2017. Although I am no portraitist, I was intrigued by the potential it gave me to create something new. I worked, years ago, on the development of the V&A Portrait Miniatures gallery and have a fondness for tiny, personal portraits. My inspiration for this piece came from this eye miniature of Mrs. Fitzherbert, George Engleheart (1750-1829). Watercolour and gouache on ivory. “Mrs Maria Fitzherbert was secretly married to the Prince of Wales, later George IV. He stopped all contact with her on his official marriage, but was buried with a miniature of her around his neck. The identity of the single eye was known to the owner, but to no-one else.” From The Story of Leicester. I am fascinated by personal mementoes and memorials and by human hair and chose to create an eye miniature of my own stitched with hair. Within is drawn from my own eye and stitched with donated human hair on a scrap of Victorian cotton taken from a disintegrated patchwork quilt.